From Megan McCarthy the award-winning author of Pop! and Earmuffs for Everyone comes the quirky, fascinating, and inspiring story of perseverance and the importance of sportsmanship set at the 1904 St. Louis Olympic Marathon. It was 1904 and St. Louis was proud to host the World’s Fair and America’s First Olympics. Hundreds of thousands of people came by car, by train, by boat. Part of the Olympics was a wild, wacky marathon. Forty-two racers registered, thirty-two showed up, and of the three racers vying for the finish line: on drove part way, one was helped by his trainers over the line, and one was a postman who travelled from Cuba and ran in street clothes that he cut off to look like shorts. How they ran and who won is a story of twists and turns that only wouldn’t be believed if it weren’t true! And it is! 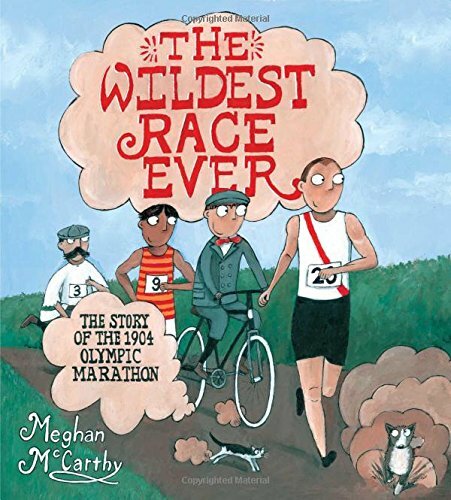 Find out who won in this wacky and well-researched picture book all about the historic Olympic Marathon of 1904.